Daughter of veteran actors Dharmendra and Hema Malini, and an actress herself, Esha Deol, tied the knot Diamond merchant Bharat Takhtani on June 29th. Esha Deol Wedding Sangeet Celebration: The wedding sangeet celebrations were held on June 25th at The Intercontinental, The Lalit Mumbai. Esha Deol was spotted wearing an orange Ghagra-Choli designed by Rocky S. Mother Hema Malini and sister Ahana Deol did performances dedicated to Esha Deol. Hema Malini, performed on her number Dream Girl to make the evening even more special for her daughter. The sangeet of Esha Deol was one grand affair. The occasion saw the who's who of the film and television industry join in the celebrations. While papa Dharamendra made a quiet entry avoiding the paparazzi and was there for a short while, Sunny Deol and Bobby Deol couldn't make it to the function. Esha's friends danced to her songs from Dhoom. The groom Bharat Takhtani danced to Jumma Chumma and Maa Da Ladla. The venue was in red-and-black colour scheme with a retro touch, flashing disco balls et al! We spotted celebs like Shaina NC, Masaba Gupta, Ashish Chaudhary, Pankaj Udhas, Arjan Bajwa, Arya Babbar, Chetan Hansraj with wife Lavina and son Ethan, Richa Pallod, Jackky Bhagnani, Deepa Mehta, Pony Verma and Shweta Pandit. Madhoo, who's Hema Malini's niece, was among the early birds. She had daughters Keia and Ameyaa for company. 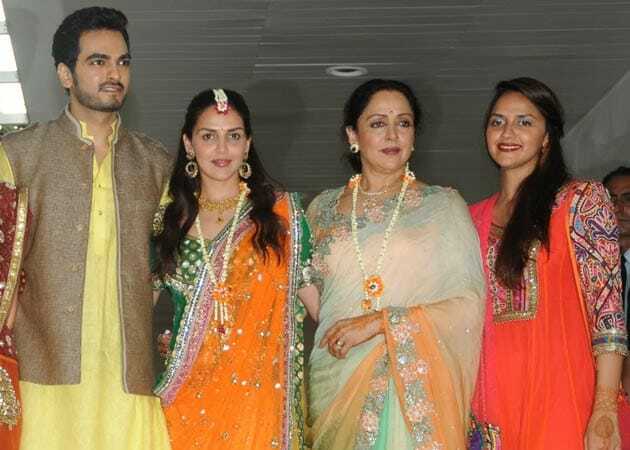 Esha Deol's Mehendi Ceremony: Bollywood veteran Hema Malini organised a grand mehendi ceremony for her daughter Esha Deol at her residence in Mumbai. The event was more of a family occasion with close friends and relatives attending the ceremony. Esha Deol showed off her fresh mehendi design extending all the way to her elbows. Her fiancée Bharat Takhtani wore brown linen Nehru jacket atop a yellow linen kurta. The couple complemented each other’s look and their makeup was not over done which went perfect with the sultry Mumbai afternoon. Esha Deol Wedding Night: June 29th was the big Wedding day. Esha Deol's wedding to diamond merchant Bharat Takhtani at the Hare Rama Hare Krishna temple in Juhu had an eclectic mix of B-Town celebrities, spiritual gurus, industrialists, close friends and family of Hema Malini and Dharmendra. Some prominient Guests: Amitabh and Abhishek Bachchan, Nita Ambani, Subrata Roy, Rani Mukerji, Anu Malik, Fardeen Khan, Vinod and Kavita Khanna and Vyjayanthi-mala. Surprisingly, Esha's half-brothers Bobby and Sunny Deol were conspicuous by their absence. Abhay Deol, was present at all the functions. Wedding Venue: The venue at the temple was the Padma Palace (a replica of the spot where Krishna and Rukmini had got married in Dwarka). The mandap was decorated with garlands of orange marigolds and pink lotuses. Huge balls of yellow and orange marigolds and pink and orange fluorescent lights also decorated the Palace. There were silver chairs for the parents, while Esha and Bharat sat on cream coloured seats.Wedding rites: Krishna hymns and chants and a live musical performance by South Indian women was heard during the ceremony. Hema had flown in a priest from the Tirupati temple in Andhra Pradesh to perform the rites, as Dharam gave the bride away. The wedding rites were all South Indian, including the vratham ceremony, where at dawn the sacred threads are tied around the wrists of the bride and bridegroom. Bharat came to the mandap in a chariot, while Esha was carried in a flower-bedecked doli. Hema and her family members greeted Bharat with an aarti and garlands, after which he and Esha exchanged garlands. After this they sat for the oonjal ceremony on a flower-decorated swing, while rice was thrown at them amidst traditional songs. Dharamendra gave Esha away during the kanyadanam, after which the mangalsutra was tied and the couple were finally wed. The event ended with the saptapadhi, where they walked around the holy fire seven times, taking a vow with each step. Abhay performed the laaja homam, where the bride gives an offering of puffed rice to the fire. As an expression of sibling support, her brother helps her in this ritual. The bidaai took place in the evening from Hema's Juhu bungalow. How the various people dressed: Hema Malini, her daughters Esha and Ahana and Bharat all wore Neeta Lulla creations. While Hema looked resplendent in a pink and orange brocade Kanjeevaram saree along with a Vishnu Dasavataram gold and gem-studded necklace, Dharamendra wore a beige suit with a pale blue shirt. Bharat wore an off-white sherwani with a brown brocade jacket in South Indian style with a stole. Esha wore a red and gold Kanjeevaram saree specially created out of three Kanjeevaram sarees selected and flown down from Chennai by Hema and Neeta. Wedding Food: While special nariyal paani with rose petals and watermelon juice was served at the wedding ceremony along with an assortment of vegetarian snacks, a lavish lunch was served on the temple premises. Esha Deols Wedding Reception: Their reception will be on June 30th at a 5-star Hotel and the Khans, Bachchans and Kapoors are expected to attend. For the reception the actress Esha Deol will wear a rose pink corset blouse with a mermaid-cut ghagra embellished with Swarovski crystals.